Two great threats to a business’s wellbeing and bottom line are subversive and unnoticed expenses. Most of these errors occur within an outdated system. Modern reporting features can track spending better, save you a great deal of money, and keep your travelers compliant. With its financial repercussions, unruly travel and expense management can’t be overlooked. Here are three T&E expense reporting features that will help you stay ahead of problematic spending. Integrating your T&E reporting platform with your company’s accounting tool consolidates your tracking and reporting tasks. It’s likely that your existing reporting system offers this feature, but you may not be aware of its capabilities and benefits. This integration combines all your financial data into one place, so you no longer have to toggle between platforms. Plus, your staff no longer has to manually enter data, and they have constant access to travelers’ spending. A single source of automated data results in less duplications, errors, and miscalculations. Your travelers are always on the go. Can your T&E reporting keep up? Having mobile apps for instantaneous tracking can catch and prevent fraudulent expenditures before they happen. Both you and the traveler can access all reports and receipts happening in real time. Travelers can also use mobile apps to capture receipts with a cell phone camera. Keeping track of when and where they’re spending can stop smaller charges from falling through the cracks. By keeping things current, everyone has full transparency and a birds-eye view of travel expenses. A corporate credit card is a great way to ensure travelers stay compliant with their purchases. However, keeping up with each transaction is tedious. Linking your T&E platform with your credit card information streamlines the expense tracking process. It’s important that your tool creates workflows that send alerts to managers for high priority transactions and anomalies. It’s also helpful when the software proactively suggests for the user to investigate risky credit card expenses. Managers save even more time with intuitive technology that approves recurring, compliant expenses. A timely reimbursement process is helpful for both the company and the employee. The danger in making late payments can result in the check getting lost or forgotten, and a frustrated employee. With an automated system, reimbursements are made quickly and efficiently. Invest in a T&E platform that sends automated repayments. To make matters easier, your tool should refund employees through your payroll or ERP/accounting system. You’ll never have to write a check again. Plus, travelers forget to submit their receipts, and some software can send notifications to travelers when it’s time to do so. 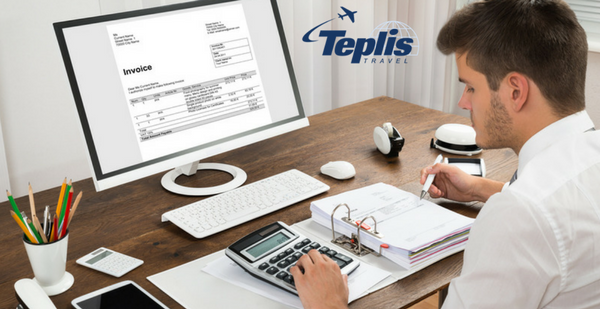 If your business needs assistance in optimizing your reports or guidance in the corporate travel sector, contact Teplis today. Call 800-669-6547 to speak with an experienced representative about a corporate solution that’s right for you. We combine the guaranteed lowest fares with highly customized service platforms to suit the needs of any business.